This week’s recipe is special. I’ve never had a chocolate meringue before, ever. Neither has my mom. Which is odd if you think about it because I have and see an amazing number of cookbooks and recipes. I knew when I saw this that I had to make it. 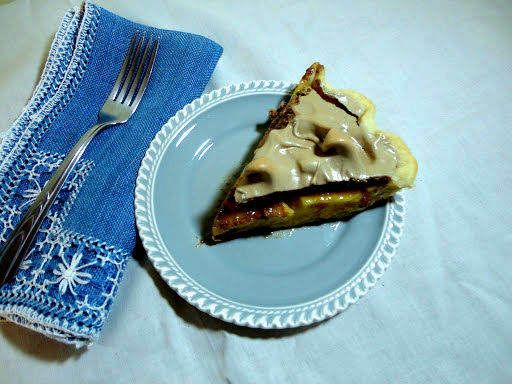 This recipe comes from a really old Martha Meade cookbook from the early 40’s. I actually didn’t change anything as the entire recipe worked just fine. Also the pie is amazing I made it yesterday afternoon and it was gone after dinner tonight. Definite endorsement there. 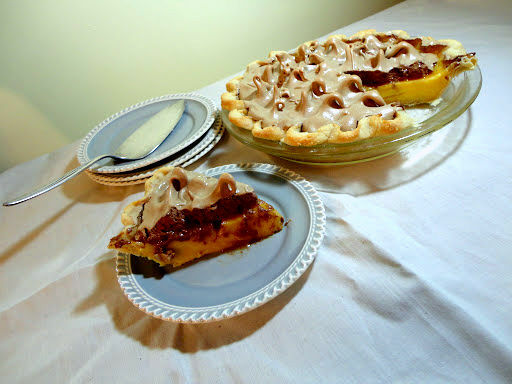 Susie Savors: This pie ranks quite high up on the savor scale (which I may or may not just be inventing). Honestly, this pie was airy and cool. A perfect summer dessert. The fluffy meringue and thick custard melt in your mouth. The flavors of chocolate and orange meld together for a burst of freshness. Expect a cleansed palate after a slice. For a person that loves fresh fruit pies, I know how dense a slice can be thick with berries or peaches or apple, but this had just the right amount of substance with a kick of sweet. Ending with a crisp pie crust and you may find yourself sneaking a second piece. Combine flour, sugar and salt in the top of a double boiler. Combine with egg yolks and milk. Cook over hot water until slightly thickened. Add orange juice and continue cooking until thick and smooth, about 20 minutes. Remove from heat, add orange rind and vanilla. 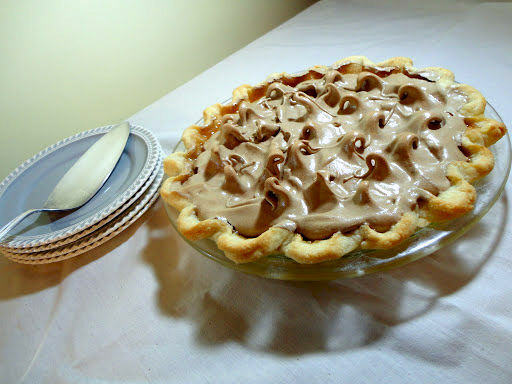 Pour into baked pie shell, top with mounds of Chocolate Meringue and bake in a slow oven, 300 degrees, for 20 minutes. Remove from oven and let stand, away from drafts, until cool. Add sugar and cocoa slowly to egg whites and beat until smooth. Fold in nuts last. Place flour, salt and shortening in medium bowl. Using a pastry cutter, cut shortening into flour and salt until mixture is pea sized. Add just enough water to barely hold dough together. Turn out on a lightly floured board and roll to fit pie pan. Fit loosely into a 9-inch pie pan, flute edges and prick bottom and sides. Bake in a hot oven, 425 degrees, for 10 minutes.